Sergei Konstantinovich Tumansky was a leading gas turbine engine designer and the most prominent designer of aircraft engines in the USSR. Since 1956 Tumansky was General Designer of aircraft engines of the experimental design bureau #300 of the Ministry of Aviation Industry of the USSR, Moscow region. Tumanskii engines were built in larger numbers than any other construction bureau (well over 70,000). He was a Member of the CPSU since 1951. With his active participation a number of Turbojet engines, which ensured development in the USSR of supersonic jet military aviation, was created. Tumansky made a great contribution to the creation of high-temperature turbines for aircraft engines, conducted fundamental research on the creation of jet engines with a two-stage compressor, and proposed recommendations for eliminating dangerous vibration stresses of compressor blades and turbines. The results of his studies created prerequisites for developing the first domestic turbojet engine with the supersonic two-stage compressor. Sergei Konstantinovich Tumansky was born on May 8 (21), 1901 in Minsk, in the family of an employee. The large family (7 children) was soon left without a father who died in 1903. Until 1918 S.K. Tumansky studied at the Vladimir gymnasium. In 1918, he voluntarily joined the Red Army, taking part in the operations of the Air Force on the Eastern and Western fronts. Since 1917 he served as a junior motorist in the Minsk Air group formed by the brother of the pilot A. K. Tutsky. The group was included in the "Thunder" Squadron, and Sergei Tumansky's civil War was held in the squadron, performing the work of a motorist, a heavy and a bombardier. In one of the sorties, a fire broke out on the plane. Sergei Tumansky had to climb on the plane and risking his life to extinguish the fire. The plane returned safely to its airfield. During his service in the Red Army in 1919, he graduated from the school of radio engineers in the city of Vladimir, and in 1922 - the Leningrad school of technicians of the Air Force / Petrograd Military Technical School. In 1921 he entered the Petrogradskaya Military Technical School of the Air Force, after which he served as a technician in the parts of the Red Air fleet. In 1927, he entered the military Air Academy named after N. E. Zhukovsky. At the academy he with great diligence comprehended the curriculum, and not only mandatory, but also optional. In addition, he was an active member of the Scientific society, which in the Academy had a great influence on the formation of young engineers. One of the groups was developing the aviation engine Tufsen (Tumansky, Ponomarev, Fedorov, Zenichkin) on the competition of Osaviashima. The project was recognized as the best, and the whole group was awarded a monetary prize-the first award for the design creativity, which for S. K. Tumansky became the main business of life. The end time of the academy coincided with a wide deployment of works in the domestic aviation engine building, and S. K. Tumansky was sent to the Central Institute of Aviation Motor Engineering (TSIAM) for the position of Senior engineer, where in 1931-38 years Engaged in research and construction of aircraft engines of different types. In 1938 he was nominated for a leading position-appointed chief designer of the aircraft plant #29 in the city of Zaporozhye. For 2 years (1938-40) under his supervision the mastering of the 14-cylinder star-shaped motor of air cooling M-87 has been completed. This motor was widely used and successfully operated on aircraft of S.V. Ilyushin. In 1939, on one of these aircraft, the test Pilot v. Kokkinaki made a nonstop flight of 8000 km from Moscow through Greenland to the United States of America. In 1939, under his leadership, the government tested a more powerful and more high-altitude motor m-88, which was a power plant on airplanes-bombers IL-4, passed the entire war. In 1940-1941 as the main designer of TSIAM, was engaged in studying of dangerous resonant torsional oscillations on operating modes of engines operation. From 1941 to February 1943-Head of the engine department of the Institute of Flight Studies (LIA). During the war, the team, headed by S. K. Tumansky, together with the teams of other aircraft construction plants conducted the finishing tests of propulsion systems for the fighters of LA-5, Yak-3 and the IL-2 attack. In February 1943, the founder of the domestic engine technology A.A. Mikulin invited S. K. Tumansky to the created plant # 300, where he worked as Deputy chief designer, since January 1955-the main, and since December 1956-the general Designer. 30 years of his creative life S. K. Tumansky gave the enterprise, 18 of them he was at the head of the firm. Member of the CPSU (b)/CPSU since 1951. With his active direct participation were created piston and turbojet engines am-39, am-39 nf2, AMTKRD-01, AMRD-02, am-3, am-5, RD-9b. Brought and introduced into the wide production of TRD R 11-300 (AM-11), the design and creation of the first samples of which was conducted (from May 1953 to January 1955) under the leadership of A.A. Mikulina. When Mikulin was removed in 1956, Tumanskii was appointed General Constructor of the renamed bureau. Since 1955 Tumansky was the main designer, and from 1956 through 1973 the design project leader of the OKB. Since 1956, S.K. Tumansky - General Designer of the Soyuz Joint Experimental Plant, where a number of fundamental scientific works related to the creation of the first domestic turbojet engines were carried out. The 100 state-of-the-art bench tests of the R 11-300 engine were successfully completed in May 1956. The engine has a six-stage axial compressor, a tube-ring combustion chamber, a two-speed turbine, and an jet nozzle. On it for the first time in practice of domestic engine technology the two-shaft supersonic compressor which provides in six steps a degree of increase of pressure of air 8.6 is applied, the design of the two-shaft rotor of the compressor and the turbine without Remote supports, developed the basic principles of regulation of two-valnyh TRDF at the flights at large supersonic speeds, applied ignonic with oxygen recharge. The TRD R 11-300 and its numerous modifications were intended for MIG and Yak aircraft. One of them was a well-known fighter with a delta wing - MiG-21, which entered a bright page in the history of aviation development. At record small takeoff weight of 7570 kg the maximum speed of MiG-21 at height of 12500 m was 2115 km/hour. Such excellent qualities could not be obtained without the excellent engine p 11-300 development of S. K. Tumansky. In October, 1959 on a plane E-66 with the engine r11f 2-300 the pilot G. K. Mosolov has established the absolute world record of speed-2388 km/h. It in April, 1961 on the plane T-66 with the engine r11f 2-300 and the accelerator U-2 has established the absolute record Height-34714 m. In total, 17 world men's and women's records were installed on MiG-21 airplanes. The engine R 11-300 was also installed on the aircraft interceptor Su-15 chief designer P.O. Sukhoi and on a number of aircraft of the general designer A.S. Yakovlev: The All-weather Scout Yak-25PB, a plane-interceptor Yak-28p and Bomber Yak-28b. In July, 1959 on a plane Yak-25rve with two engines ? 11-300 the test pilot V.P. Smirnov has established world records of height with cargo 1000 kg-20456 m and with cargo 2000 kg-20174 m.
By the Decree of the Presidium of the Supreme Soviet of July 12, 1957 for the great successes in the creation of aviation technology Sergey Konstantinovich Tumansky was awarded the title of Hero of Socialist Labor with the Order of Lenin and the gold medal "sickle and Hammer". In July, 1958 under the direction of S. K. Tumansky The design began, and already in November, 1960 the complex of finishing tests of the TRD Ru 19-300 was finished and in February, 1961 the engine successfully passed the state tests. This compact and highly reliable turbojet engine has been used for training aircraft Yak-30 and Yak-32. When after the first successes in space N. S. Khrushchev began to pay less attention to aviation, S.P. Tumansky has decided to master design of ZHRD. The engines of R 201-300 for the air-to-ground missile and P 209-300 for the target rocket of the chief designer A. Bereznyak were created in the OKB. In 1962-1963, the design department of the JDDS began developing liquid rocket micromotors designed to orient and stabilize spacecraft. Since this topic was considered very promising, S. K. Tumansky achieved the organization of a special OKB as a branch of the plant #300. Under his leadership were created the first micromotors R 210 D-300 and P 210 E-300 thrust 1.3 and 16.5 kgs, respectively. A wide range of interests and opportunities allowed the staff of the plant # 300 under his leadership along with the creation of engines to engage in a fundamentally new direction-refrigeration technology. The designers proposed a new thermodynamic cycle (it is known as "Russian Cycle" abroad). Using the high efficiency of the axial compressor and the air turbine, it was possible to create an original aerial refrigerating machine ?HM-300, in which the level of temperatures below-80°C was reached. The team of creators of this machine was singled out as a separate organization. Another non-traditional direction in the activity of S.K.Tumansky in the 1960s works related to the creation of a nuclear power plant Tu-5 ( "Poplar ", later "topaz ") with an electrical capacity of 5 kw. The team of its developers also stood out in a separate OKB. In the 1950s-60s in LIA began to create experimental and experienced aircraft vertical takeoff and landing (SVVP), and designers were created "Turboletm ". S. K. Tumansky proposed to install on it the modified engine am-5. In 1962, the chief designer A.S. Yakovlev proposed to S. K. Tumansky and his KB-300 to develop the necessary TRP for the aircraft vertical takeoff. Tumansky proposed a palliative solution: to remake the engine for SVVP one of the modifications of the engine P 11-300. In the process of alteration was created TRD R 27-300. It was installed on the airplane Yak-36. In July 1967, at the Domodedovo Aviation Parade, the Yak-36 demonstrated the ability to fly vertically and sit down, which at that time was perceived as a miracle. There was an idea to apply this plane on the Soviet aircraft carrier. The cruiser "Kiev " and a new SVVP Yak-36 m with more powerful lifting-cruise engine r27v-300 and two lifting engines RD-36-35 FV, created by S. K. Tumansky and its OKB for 2 years were built. On February 25, 1972, the test pilot M. S. Dexbach on the pilot Yak-36 m for the first time flew the "full profile": Vertical start, horizontal flight and vertical landing. On November 18, 1972, he made his first landing on the ship, and on November 22 he flew to the "full profile" from the deck. This day was the birthday of deck aviation. In addition to the design activities carried out fundamental research on the creation of jet engines with a two-stage compressor, a lot of attention paid to study the best ways to regulate compressors, the forsathe chamber and reactive Nozzle. Significant works were carried out on elimination of dangerous vibrations of blades of compressors and turbines and on introduction of original constructive elements for struggle with this phenomenon which has caused a lot of troubles in operation and reduced reliability of reactive Engines. S.K. Tumansky repeatedly visited abroad and visited the International Aviation Exhibitions - in England (1957, 1964) and France (1967). In 1964 S.K. Tumansky was elected a corresponding member, in 1968 - a full member of the Academy of Sciences of the USSR. S.K. Tumansky was a member of the scientific and editorial councils, expert commissions, led the scientific work of young scientists. S.K. Tumansky was also engaged in social activities: in 1949 and 1950 he was elected a deputy to the Council of Workers' Deputies. For many years he lectured and supervised graduation design at the motor faculty of Mai. He brought up a whole galaxy of scientists, designers, engineers and other specialists. Since 1968-Academician of the USSR Academy of Sciences, combined the management of the design bureau with work in the Institute of the USSR. Tumansky was repeatedly encouraged by government awards. 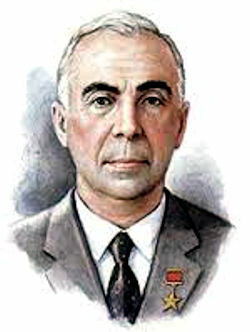 Tumanskiy was awarded the laureate of the Stalin Prize (1946), and Hero of Socialist Labor (1957). Lenin prize winner (1957), Gospremii of the USSR (1946). He was awarded four Orders of Lenin, the Order of the Red Star (1967), the Order of the October Revolution (1971), the medal “For Valiant Labor. In commemoration of the 100th anniversary of the birth of V. I. Lenin ”(1970). He was apecialist in the field of mechanics and machine building. Corresponding member of the Soviet Academy of Sciences for the department of mechanics and control processes from 26 June 1964, academician for the department of mechanics and control processes (machine building) from 26 November 1968. Sergei Konstantinovich Tumansky died on September 9, 1973 in Moscow, and was buried at the Novodevichy cemetery. The name of S. K. Tumansky was awarded to the Moscow Aviation Motorostroitelnomu Technical School (now Moscow College of Aviation Motor-building).